Breast pain, whether severe or mild, is a common symptom during postmenopause that can be very irritating. Simple things like putting on a shirt or exercising can cause sharp pain. This may be a new occurrence or a long-recurring cycle from decades of premenstrual syndrome (PMS). Fortunately, there are plenty of treatment options available for alleviating breast pain, regardless of what triggers it. 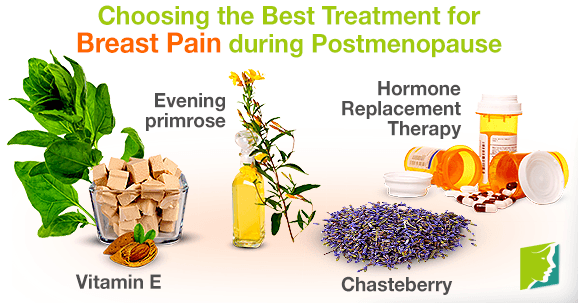 Learn more about how to treat breast pain during postmenopause. The many benefits of chasteberry have been known since Ancient Greek and Roman times, through the Middle ages, and up until present day. Since the 1950s, it has been regularly prescribed throughout Europe to treat cyclic mastalgia, or breast pain that occurs due to hormonal shifts. Chasteberry works to suppress the production of prolactin, a hormone that stimulates milk production for nursing mothers. The lower levels of prolactin help relieve the pain, since an accumulation of breast milk in non-nursing women can become painful. Chasteberry has also been shown to help reduce other PMS-like symptoms, such as cramps and mood swings. Various Native American tribes have used this wildflower for women's health for centuries. Oil is extracted from the seed to treat gynecological disorders ranging from PMS to menopause symptoms. However, evidence regarding its effectiveness is contradictory and more research is needed in order to determine its medicinal value. Vitamin E is a fat soluble compound that has powerful antioxidant properties. Studies have found that daily doses of vitamin E can greatly reduce the severity of breast pain. You can take a supplement or find an abundance of vitamin E in tofu, spinach, almonds, and sunflower seeds. Hormone replacement therapy is a prescription medication made of external estrogen, sometimes combined with progestin. It is often used to manage menopause symptoms, but it has mixed results for treating breast pain. Women who have frequent tenderness before taking it often see improvement, but women who have little or no pain often experience greater pain. In addition, the risk of breast pain from HRT seems to increase with age, so it may not be suitable for postmenopausal women. When it comes to hormonal breast pain, these treatments are the most viable options. Instead of allowing the tinges of pain and sensitivity get in the way of your physical activity or intimacy, understand the root causes so that you can help the discomfort subside. The best treatment may vary depending on each woman's circumstances, so consult your doctor to find the most appropriate one for your case.